It is my New Years resolution to keep up with my blog. Although I promised myself the same thing last year, it seems as though I have a lot of catching up to do!!! 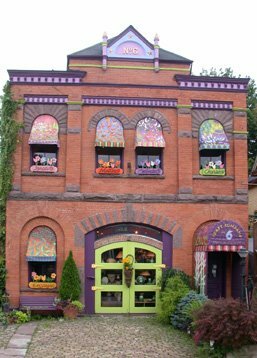 Several months ago A Tail of Two joined an esteemed group of artists and crafts people and is now carried by the award winning gallery Craft Company No.6 located in Rochester, New York. Lynn and her staff - which includes Margie the Jack Russell/Corgi mix, Buddy Ray, Bob, and Dixie Belle the Basset Hounds, and Ernie the Jack Russell, (as well as the human staff members) graciously welcomed us into their gallery as any fellow dog lover would. The gallery is located in the renovated Engine Company No.6 Firehouse. For over 25 years Lynn and Craft Company No.6 have been bringing unique handmade jewelry, glass, pottery and furniture to everyone living in or visiting Rochester, as well as those shopping online through her wonderful website. Craft Company No.6 has been repeatedly voted as a Top Ten Gallery by Niche Magazine so I am honored to be represented by them. so get inspired, but don't steal, karma is real.